It is a rare occasion when we move from behind the camera to in front of it. However in the context of SMALL EMPIRES, we were glad to do our part. It was great to spend some time with Alexis Ohanian, the founder of Reddit and author of the new book Without Their Permission, producer Stephen Greenwood, and his talented crew discussing the merits of Squarespace and the democratization of design. After working with Squarespace and using their platform to launch sites for some of our clients and for ourselves, we were asked to share our point of view on the product and how it impacts our business, including our shop, JnrlStr, and the work we did for Alder, Wylie Dufrense's take on the American gastropub. Watch for special appearances of Marvis Toothpaste and Paul Frances. When we started our creative studio JaegerSloan Inc, in 2010, we wanted to create things that interact with and better the community around us. In parallel to the studio, we wanted the opportunity to go beyond what we already know and do things that expanded what we're capable of. 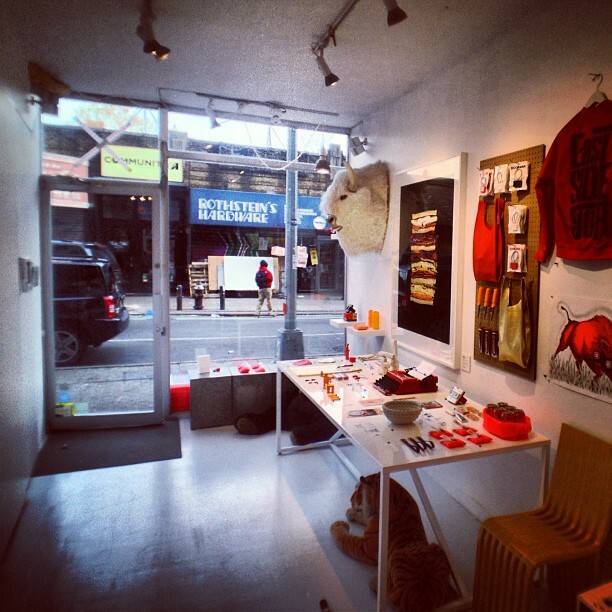 So in January 2011 we rented a storefront at 55 Clinton Street in Manhattan's Lower East Side. It was small, it was open, and it was raw. It became a workspace for us and an opportunity. With its blank walls and black floor and 18 foot throw distance, we began to experiment with projected art, launching our gallery JSx55. From projected art we invited photographic prints, watercolors that react to projected light, and laser cut wooden sculptures. Through all of this we learned that we have an appetite for bringing unique and remarkable people and things together in interesting ways. Starting this month we take a new name, and a new mission. At JnrlStr (pronounced 'general store') our aim is to offer useful, beautiful and innovative products -- the best of everything you need to survive and prosper. We began by curating art that shared the theme of everyday things seen in new ways, and we see this as a rich and dynamic way to broaden that point of view. By design we're aiming to keep things fresh (and organized) by merchandising the store with a dominant color each month. We started with orange this November and are now featuring red for December.Currently we stock products by Areaware, Baggu, Bookman, Braun, byAMT, Malin+Goetz, Marvis, Mason Pearson, Olivetti, Tattly, View Master. We'll also continue to sell the art collections we've presented including Scanwiches and Skittish Tree, and will be curating more to fit within the color theme of each month. We hope you'll find something you'll love!